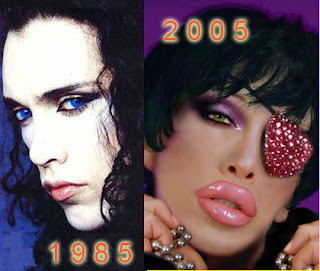 Former 1980's Dead or Alive singer Pete Burns has won a settlement for botched lip surgery, according to The Plastic Surgery Channel. He won the equivalent of about $900,000 from a doctor who injected a product, Outline Original, known to create bad side effects. Eventually Burns was left so disfigured that he could only drink through a straw and became a recluse, even contemplating suicide. Burns has said that he needed to undergo 100 additional operations to fix the problem. I've never heard of Outline Original, and because of the high risk of side effects am choosy with what I inject into the lips (only fat, Restylane, Juvederm, and Prevelle). Hopefully the money Burns won in the settlement will help him get "right round." What in heaven's name is that thing on his face? Is this the botched procedure or did it happen after the second photo was taken? It looks really, really bad. I hope it is amended, and quickly. His lips were already huge before he had the allergic reaction. He has been using various products for augmentation since the early 1980's but he had these huge ones done in about 2003 when he launched a greatest hits collection. I don't condone bad practice but its kinda hard to feel sorry for him when he obviously opted to look like a freak in the first place. Anyone who has plastic surgery is trying to alter the way they look.. They want to look a way that makes them feel better about themselves.. why would you call him a freak? He does not look like one.. If a doctor screwed up, then why shouldn't he be entitled to the money... I'm sure many view you as the freak mr/mrs anonymous..